East Jakarta Bina Marga Sub-dept. repairs seven broken bollards. This repair involves contractor since it is still in one-year maintenance period.
" All of them have been repaired by vendor because it is still in one-year maintenance period"
"We found seven broken bollards on the field. All of them have been repaired by vendor because it is still in one-year maintenance period," stated Anto Marpaung, East Jakarta Bina Marga Sub-dept. 's Sidewalk Section Head, Thursday (9/6). He said, bollard could be broken due to various causes. Such as it could be caused by vandalism thus people could pass through it or getting hit by parking cars, street vendors, or others. "Those seven bollards are installed in different places. Four units are on Jalan Dewi Sartika, two units on Jalan Matraman, and one unit on Jalan Soemarno," he informed. 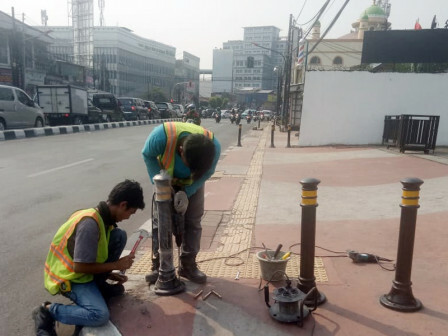 In 2018, his side installs 3,015 bollards according to contract with total budget Rp 1,575,337,500. All units are installed in 10 sub-districts while repairing its sidewalks.